Hello everyone and thank you so much for stopping by today to help celebrate Hero Arts Holiday 2016 Release (more about this below). 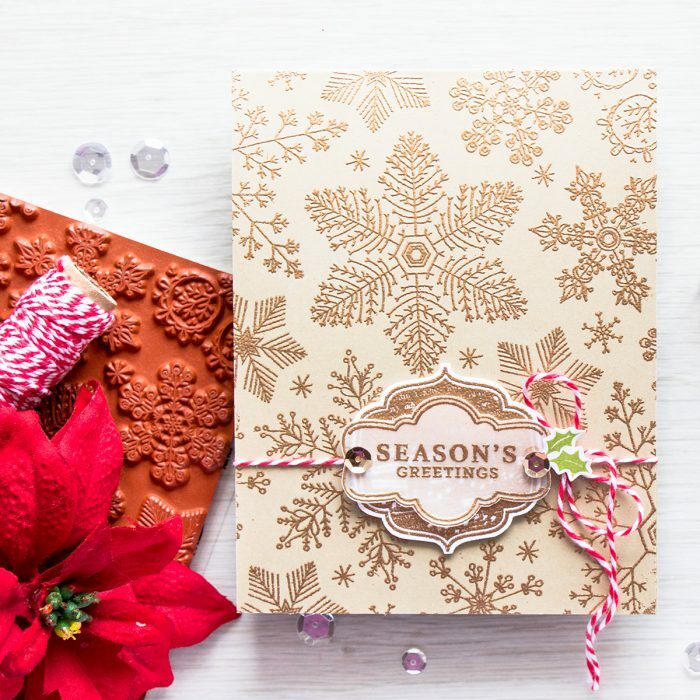 Hero Arts 2016 Holiday catalog (browse it here or below) is filled with amazing inspiration, beautiful products and better yet fantastic products. The one product that stood out most and the one I loved most was the set of Paper Layering Snowflakes dies. Paper Layering is a unique line of dies that create only partial die cut designs and allow for beautiful 3D effects. If you are a subscriber of my blog you might have already seen my cards with the Paper Layering Palm Tree and also Paper Layering Pineapple dies. 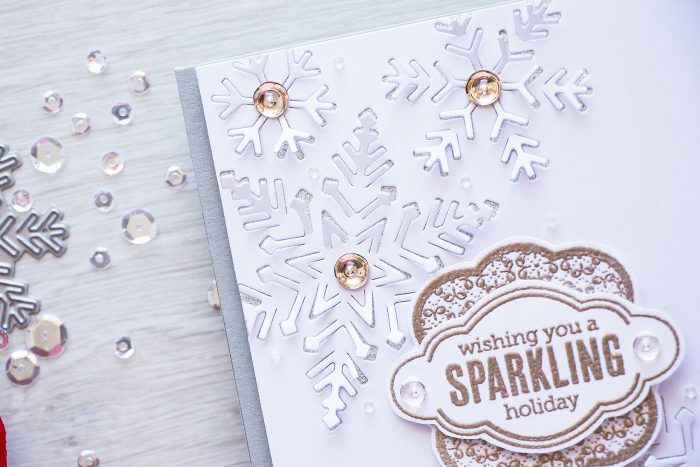 Today I’d like to share a closer look at the Paper Layering Snowflake dies and show you a Clean & Simple card created with their help. The Paper Layering Snowflake dies can be used with or without the outer frame die (watch my video above to see the difference). To achieve the look I have on my cards you’ll need to use just the snowflakes, no frame dies. Here I layered 3 snowflake dies onto a panel created out of white cardstock and taped them in place with washi tape, I die cut one corner of my panel, flipped the dies and taped them onto the other corner and die cut again. 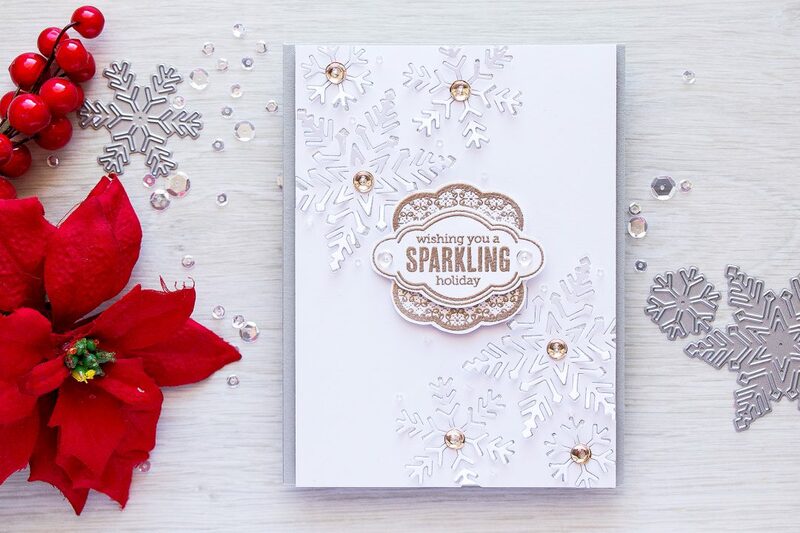 I wanted to add a bit of shine and sparkle to this card, so I layered silver glitter paper under my die cut panel so that silver glitter would show through the snowflakes. I’m sharing another card below where I’ve layered gold glitter paper. To create my sentiment I used two stamp sets – Holiday Messages and Tags and Christmas Messages. I heat embossed my images in Platinum embossing powder onto white cardstock and cut out with my scissors (there are matching dies available). After I foam mounted the frames onto the die cut panel and foam mounted my panel onto a light gray card base I adhered a gold sequin inside each snowflake and also added a small clear droplet from Pretty Pink Posh. I also adhered several clear beads – they create the illusion of snow that is about to melt. When creating a card like this keep in mind that it would need to be hand delivered and mailed in a box to preserve the 3D effect these snowflakes provide. Like I mentioned I have another similar card using the same supplies. The difference here is in the colors of glitter paper and cardstock and also embossing powder. My frames were heat embossed onto vellum here and only the top frame was foam mounted. Want to see entire Hero Arts Holiday release? Browse the catalog below or look at new products on Hero Arts website. I had a blast creating projects with the new products from Hero Arts. Here are a few additional cards I made using new goodies. Season’s Greetings – using same Holiday Messages and Tags stamps and Snowflake Bold Prints background stamp. Images heat embossed in Brass Embossing Powder. 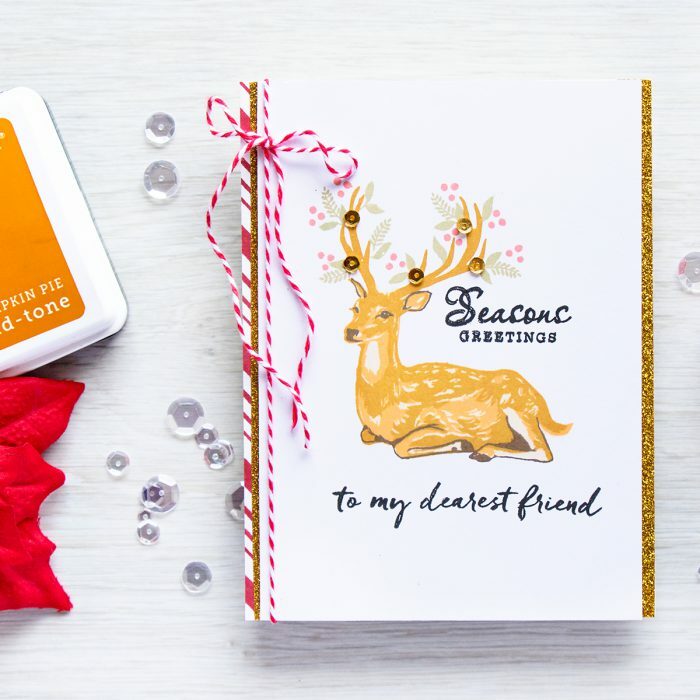 To My Dearest Friend – using Color Layering Deer stamp set, a sentiment from the Christmas Messages set and the following ink colors: Soft Vanilla, Soft Apricot, Pumpkin Pie, Cup O’ Joe to stamp the deer. Hero Arts is giving away three $25 shopping sprees, drawn from comments left across all blogs in the hop. Please comment by Sunday, August 28 at 11:59pm PT, winners will be announced the following week on Hero Arts blog. Beautiful cards, Yana! Love the snowflakes and your deer is all decked out for the holidays. Your cards are so elegant. Love them with the popped up stars. Nice start for the holidays for you. The dimensional card is AMAZING. I am really in awe by these dimension dies. Your card is so beautiful! 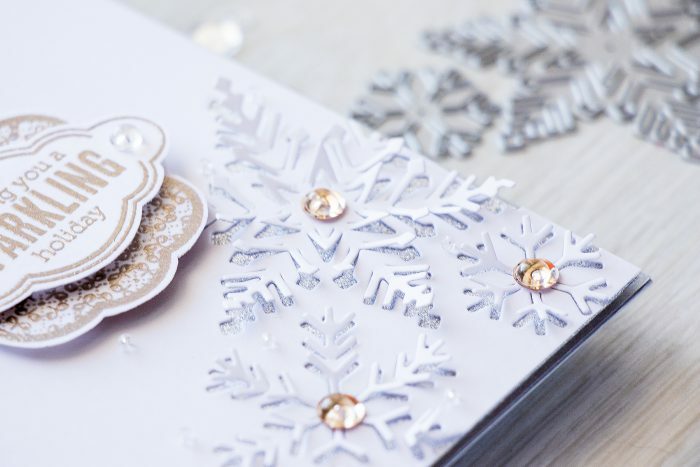 Love the 3D effect in the snowflakes in the card!! I love these hops because I always get introduced to several new artists. 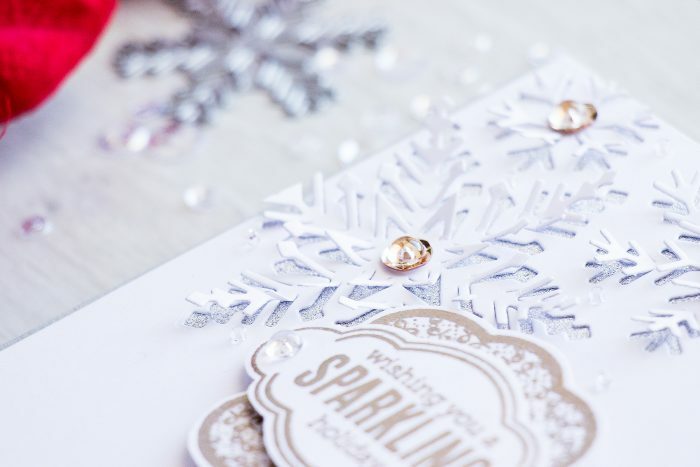 Your 3-D snowflake card is so elegant, sophisticated and stunning–everything I am not, but maybe I could fool some people if I made cards like yours! 😉 The gold embossing of the snowflakes on the other card gorgeous! 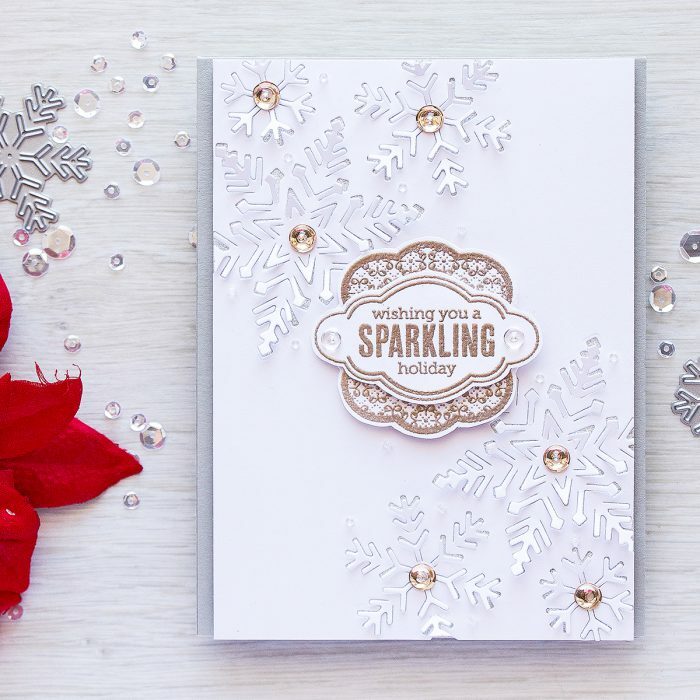 I love the snowflake with paper layering card! Gorgeous!!! Hana, Hero Arts new layering stamps and dimensional dies are fantastic!!! I totally love those snowflake dies! your cards are gorgeous! LOVE that layered deer and also really like the pop out snowflake design. It is so fun for the holidays! Always love your work. Thanks for sharing and for the chance to win! Love your cards as usual! Those layered snowflakes are super nice! The gold and white looks great together . I also really like that snowflake background. Thanks for the great video on the snowflake card. It is really special. I hope to try some. I love your cards but I love that snowflake more. Gorgeous, just gorgeous! Thank you for sharing! Oh I love snowflakes! I have more snowflake dies and stamps than anything else I swore no more, but I think I might break and get this one. Thank you!